The third book in Simon Nicholson's Young Houdini series has appeared on Amazon.co.uk. Young Houdini: The Silent Assassin will be released in the UK in January 2016. Here's our first look at the cover and plot. The world's most famous magician. But before his name became legend, who was young Harry Houdini? London, 1886. Lady Flora Cusp, devoted to funding libraries for the poor, has been shot in her room. Who could possibly have wanted to harm her? It is up to Harry, Billie, and Artie to find out who did it, and to stop the gunman from striking again. But as they delve deeper the case takes a deadly turn. Harry may be an incredible escape artist, but with the assassin now on his tail, how will he get out alive? 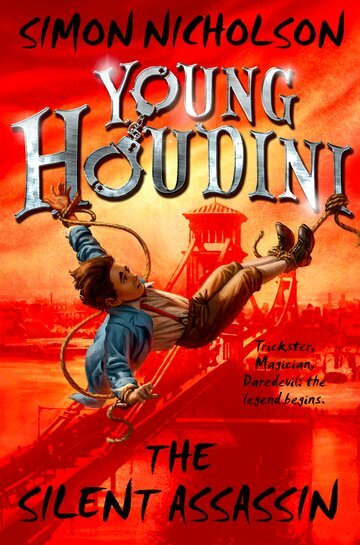 The Young Houdini series is published by Oxford University Press (OUP) in the UK and by Sourcebooks in the U.S. There is yet no listing on Amazon for a U.S. edition of The Silent Assassin. Other books in the series are Young Houdini: The Magician Fire and Young Houdini: The Demon Curse. Film rights have been sold and author Simon Nicholson has dropped hints that it could become a TV series. Pre-order Young Houdini: The Silent Assassin (UK edition) at Amazon.co.uk.